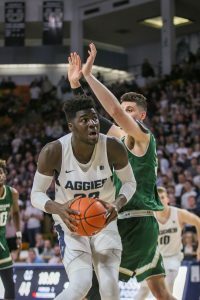 The Utah State men’s basketball team started quickly on Saturday night in the Dee Glen Smith Spectrum, ultimately staving off Colorado State for the 87-72 victory. Freshman Neemias Queta led the Aggies with a spectacular performance, notching a double-double with 18 points and 11 rebounds plus two assists. From the tip, USU asserted itself with a 14-2 run to separate from the Rams. CSU responded, cutting the lead to four points on several occasions after a 12-4 to run of their own. The freshman duo of Brock Miller and Queta, however, proved too much for Colorado State to handle as the Aggies utilized a 13-3 run to extend the lead back into double-digits. A short 5-0 run in the final minute of the half brought CSU within 44-35 at the half. Miller led the Aggies with 15 points in the first 20 minutes, shooting 5-8 from behind the arc. Miller would finish with 18 points for the game, tying his career-high for 3-point makes in a single game with six. The Aggies quickly pushed their lead back into double-digits in the second half, but were unable to fully put the Rams away. CSU again trimmed the lead to nine points at the 12:19 mark before a layup from Diogo Brito restored the comfortable margin for Utah State. The Rams would not see a single-digit deficit for the remainder of the game. Junior Sam Merrill added 16 points and eight assists for the Aggies, while senior Quinn Taylor and Brito each pitched in with 12 points. The game was a distinctive statement for Queta, who faced one of his biggest tests of the season in CSU’s Nico Carvacho. 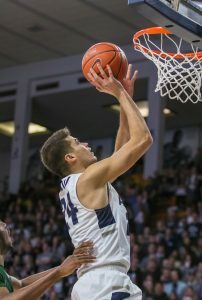 On top of tallying one of his best offensive performances of the season, Queta anchored USU’s defense, playing an integral part in holding Carvacho, the conference’s leading rebounder and seventh-leading scorer, to only 12 points and 10 rebounds with five turnovers. 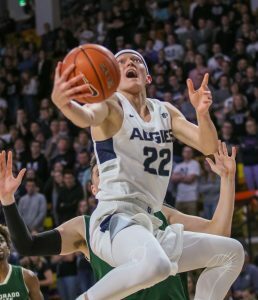 The win re-establishes Utah State among the upper echelon of the conference, as the Aggies currently sit alone in fourth place in the MW standings, one game behind a three-way tie for first place between Nevada, Fresno State, and UNLV. Utah State receives their conference bye this coming week, and will next play on the road at New Mexico. Tip-off is currently scheduled for Saturday at 2 pm MST.